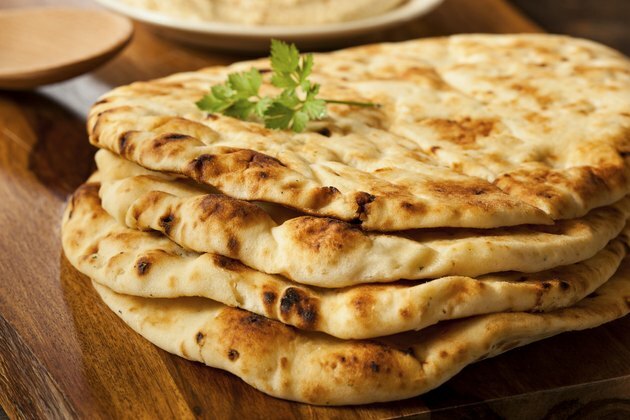 Plain naan is one of the healthier options to accompany a meal at an Indian restaurant, according to MedlinePlus. Opting for one of the sweet or savory filled versions, such as coconut or garlic, may increase the calories somewhat and make it a less nutritious option. A 3-ounce piece of regular naan provides 247 calories, 8.2 grams of protein, 4.8 grams of fat and 42.9 grams of carbohydrates, including 1.9 grams of fiber. Opt for the same amount of whole-wheat naan and you'll consume 243 calories, 8.7 grams of protein, 5.7 grams of fat and 39.3 grams of carbohydrates, including 4.1 grams of fiber, or 16 percent of the daily value. Masala tandori naan, which has garlic, onions and spices mixed in, provides about 237 calories per 3-ounce serving, along with 9 grams of protein, 3 grams of fat and 45 grams of carbohydrates, including 3 grams of fiber. Regular naan is a good source of iron and the B vitamins niacin, thiamine, riboflavin and vitamin B-6, providing more than 10 percent of the daily value for each of these micronutrients. Whole-wheat naan contains many essential micronutrients as well, providing more than 10 percent of the daily requirement for magnesium, phosphorus, thiamine, niacin and vitamin B-6.